Puppy madness and adoption of Maya. Yesterday the ScPA had 5 puppies and today only one is left! 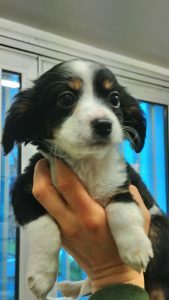 Yes, this has been one of our most sought after litters ever, with four of the pups leaving immediately. That is great for them, naturally, but please spare a thought for little Dagobert, who is all alone tonight. Bearing in mind that the refuge is open tomorrow, perhaps he won’t be alone for too long. The adoption of the day has to be that of Maya. Her arrival almost two weeks ago was the fourth time she had been at the refuge since September. On previous occasions she has always been collected just as her pound time was coming to an end. That is fine, but at one stage the employees were wondering if the refuge was being used as a cheap kennelling service. This time however no one came to collect her, and although she is young and pretty, we never know how long dogs will wait for a new home. In Maya’s case, it took just two days after her pound time was officially up. That is wonderful news for her. Maya was born in April 2018, and it is great that she can do the rest of her growing up in her new home. We don’t really have any decent photos of her, as the weather has been so rotten that taking pictures has been a bit difficult. We hope you get the idea, though! So it was a good day at the ScPA today and hopefully tomorrow will be another one! We had two more adoptions today to further brighten the mood. First to leave was Canon. I love this dog. He arrived at the refuge at the beginning of November, only to be diagnosed with ringworm. And we know what this means….isolation until the infection has been dealt with; this is not something you want to spread around a busy refuge. Or anywhere else, for that matter. As ever the staff did a fabulous job, but Canon was not happy at being alone. As soon as he was better he was mixed with another dog, and his life improved enormously. Being black, Canon (which means “Stunner”) could have had a long wait. If his colour didn’t put people off, his slightly long ears might have. Long eared dogs have a bad rep! 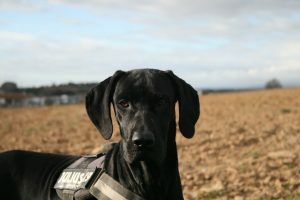 Many of them are not at all keen on hunting and can be as much couch potato material as other dogs. But as we always say, it only takes one family to fall for a dog, as long as it is the right family. And it looks like Canon has hit the jackpot. He left the ScPA today with a wonderful life ahead of him. We are delighted too at the departure of Gimli. He has been adopted before, but sadly he was returned as the family’s young child found Gimli to be a bit too energetic. When choosing a puppy it is important to consider the fact that puppies want to play a lot, and until they know better can use their teeth to explore. It is never done with malice, but that doesn’t mean it doesn’t hurt, and of course small children can be a bit overwhelmed. Some puppies are calmer than others. Gimli is one of the others! Luckily for him he hasn’t waited too long for his new home, and we hope he will know nothing but happiness from now on. On the subject of puppies, Facebook followers may have seen that we have more pups, the “Famous Five litter”. These setter pups are going to be popular, no doubt about it! Here is Annie…and there are four more like her! Before the ScPA even opened we had the big news of the day. Leo has left the ScPA!! Followers of the blog will know all about him; in fact anyone who is on dog-rescue sites on social media is probably aware of his story. 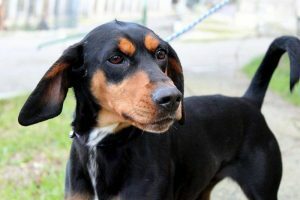 Brought to the refuge at the beginning of October, supposedly having been found, this dog’s foreign chip made him a health risk which resulted in a euthanasia order from the local government department responsible for the refuge. In her blog of 25th November, Moira tells of the incredible efforts that were made to save him. As most of us in dog rescue know, however, saving a dog does not end there. By definition refuges are safe places, but if no dogs leave the refuge, then we all know what happens; there is no room for new arrivals. There was a lot of interest in Leo when he was at risk. 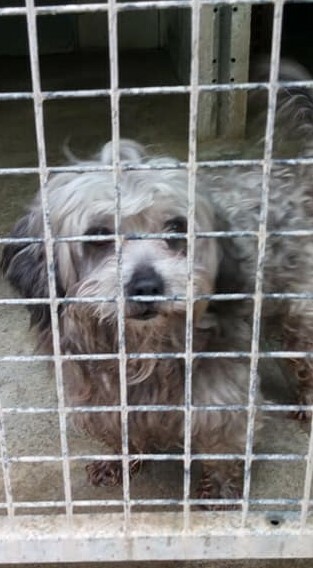 As well as the help we received, there were also threats to staff and volunteers, as well as menacing phone calls and emails from “dog-lovers”. However, once Leo was “safe”, it all went quiet. This proves yet again that it is far easier to sit behind a computer and criticise than it is to actually do anything constructive. 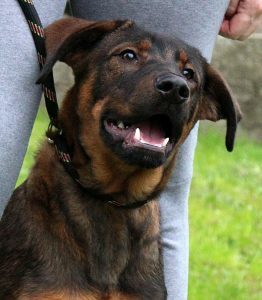 Luckily a German association has offered a place to Leo, where hopefully he will have more luck in finding a home than he has had in France. This morning he left the ScPA (under the TRACES system, of course) for his trip to Germany and we will follow his progress there and keep you posted, of course. That news alone would have been enough to make the day a good one, but in fact we had two further adoptions. First to leave this afternoon was Edge. 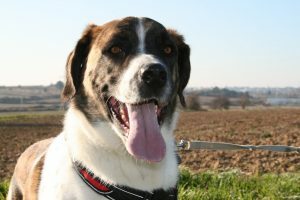 He is an Australian shepherd cross who was brought back from a previous adoption. He is a nervous dog, and being exposed to too much too soon can cause him to panic. He will be fine in a calm house where slow and steady approach is possible. This was not the case in his last home. However Edge’s new family are taking lots of advice on how to deal with this boy’s fears. They visited a couple of times before adopting him, and already he has made great progress with them, and we are sure that he is now in a place that is right for him. Then today, and after nearly eight months at the refuge, we said goodbye to Pica. When this lovely girl arrived in June last year she was extremely nervous of everyone and it took her quite a long time for her to show her true personality. A lot of credit has to be given to the employees and volunteers for all the walks and love they have given to Pica over this period. As with Edge, slow and steady wins the race, and this was certainly the case with Pica, who is almost unrecognisable when compared to the dog who arrived. So not bad for a rainy Thursday, and there is more good news to come on what will probably be a rainy Friday! More good news today with the adoption of Bowling, a young dog who arrived in early December. 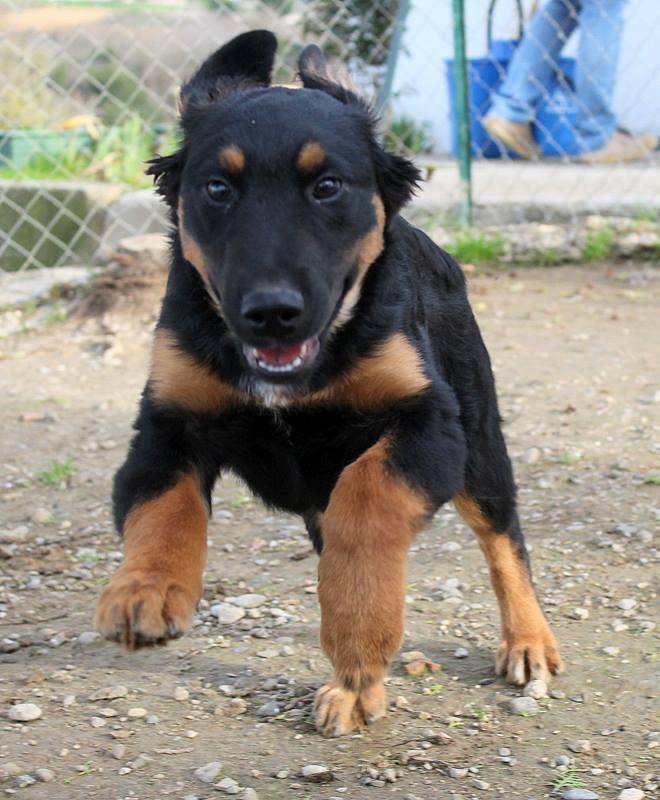 He is one of the many “not quite pups” who arrive at the refuge each year. 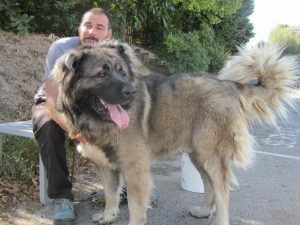 Typically these dogs arrive at the age of 6-10 months, and are usually on their way to being big (or at least bigger than their owners planned for) and usually lacking in any training. All puppies are cute, let’s face it. In their early months any problems can usually be dealt with easily. However it takes work to turn a pup into a good dog citizen, and it is when effort is required that dogs are dumped at the refuge, almost always unidentified. The ScPA keeps them for ten days, just in case, but experience has shown that this wait is futile, invariably it is a question of finding a new home for the dog. And of course the sooner the better (providing it is a good home, of course). We hate to see these dogs behind bars, wasting what should be the most exciting days of their lives. No dog is ever too old to learn, of course, and all these youngsters need is some patience and love. Bowling is a great lad; young, bouncy, playful and sociable. And very handsome. Today after what has been a long couple of months he left for his new home, and we hope he will be very happy. 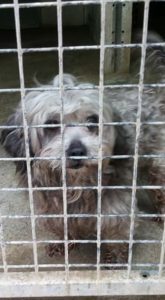 If only our other “not quite pups” could be as lucky…..
Another dog, eight year old bichon cross Rex, was collected after four cold, wet days behind bars. He arrived identified but his owners took so long to collect him that a couple of people had their eyes on him as a future companion. Still, tonight he is back in the warm, and we hope that is the last time we see this lad at the refuge. If all goes according to plan, tomorrow looks to be a bumper day, so see you then! There has been a phenomenal response to last night’s “Hot Dog” appeal. Installation of the heat lamps is one thing, but contributing to the running costs of the lamps is every bit as important. So many thanks to everyone who has donated or who plans to do so. It is wonderful to see such solidarity, and we have had donations from all over, not just the UK and France, but also from Australia and the United States. Such is the benefit of social media. Now onto today’s news. And it is BIG news! We spoke on Saturday about the popularity of small dogs, and how they tend to leave far earlier than the bigger dogs. Well, today we said goodbye to almost the biggest dog at the refuge. Harley was brought in for rehoming just before Christmas as the result of his family’s divorcing. He had done nothing wrong at all, and although we know that divorce is hard on everyone, imagine what it is like for a dog. Hearing Harley crying in his kennel was just heartbreaking. I took him out for a long walk shortly after his arrival and he lay down at my feet and rolled on his back for a belly rub. He is a big lad, but very much a baby…albeit a 50kg one! Easy on the lead, fabulous with people and other dogs, we all knew that this boy could have a long wait ahead. Much to everyone’s joy, a family came to the refuge last week and offered a home to Harley. 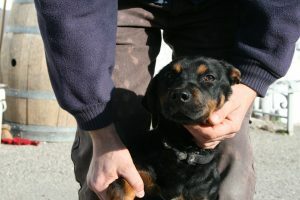 He will be with his new owner all the time, as he can accompany them to work in the vineyards and then chill out in the warmth of a loving home once again. Excellent news to start the week. And hopefully more is on the way. First off tonight, many thanks to everyone who came along to walk the dogs today. Yes, we know it is cold outside and there is a temptation to stay where it is cosy, but the dogs need us. It was great to see so many dogs out and about and to welcome reinforcements to the team of volunteers. If you think you might like to join in, don’t hesitate to get in touch. Now to news of adoptions! Yesterday the ScPA said goodbye to two dogs. Mazarine and Pawnee. Both of them are young and female, and hence both easy to rehome. In fact we had several people interested in each of them. 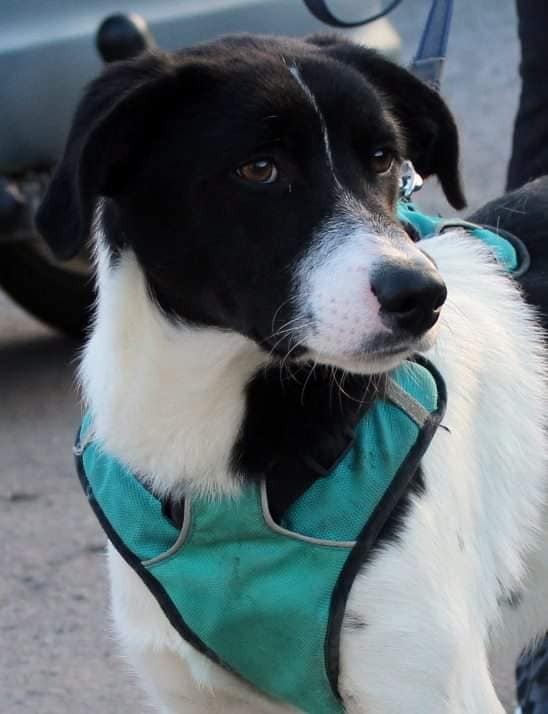 Naturally this means that some people are disappointed, but we are hoping that potential adopters are willing to offer a loving home to another dog, even though their first choice dog has left. The length of time a dog remains at the refuge depends on a number of factors, obviously. Colour seems to play a role, but size is perhaps the key factor. In fact small dogs are often reserved almost as soon as they arrive, while they are still in the “Pound”, in fact. Of course this can result in disappointment, as until the ten days are over, the owner could reclaim their dog. 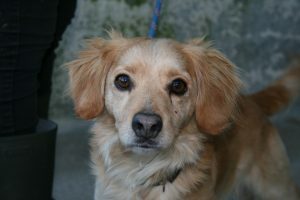 Today’s leaver, Apache, is another tiny one, and like Pawnee, he was reserved while he was still in the “Pound”. Yes, it seems that if you are a dog looking for a new home, it really is better to be small. However there was a reservation today, and it was of a bigger dog, and what’s more, one who has been there for over six months. So good news is on the way. First to Goupil. This gorgeous lad arrived arrived exactly ten days ago, unidentified, it almost goes without saying. 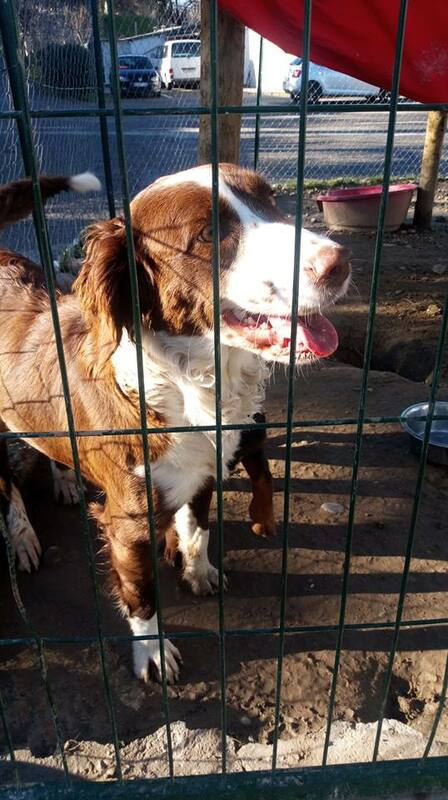 One has to wonder where he was before arriving at the refuge; is there a family somewhere missing their beloved dog? Who knows. One thing is sure though, Goupil’s new family, who reserved him during his pound time, were mightily relieved when today came around and they were able to take him home. This ten day period is fraught with nerves! 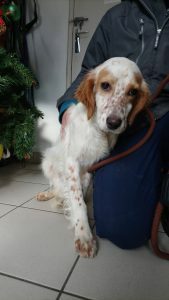 As for Goupil, his time at the refuge will soon be forgotten as he starts a new life together with two children who are absolutely delighted with their new companion. Today’s second leaver has spent more than ten days at the ScPA. 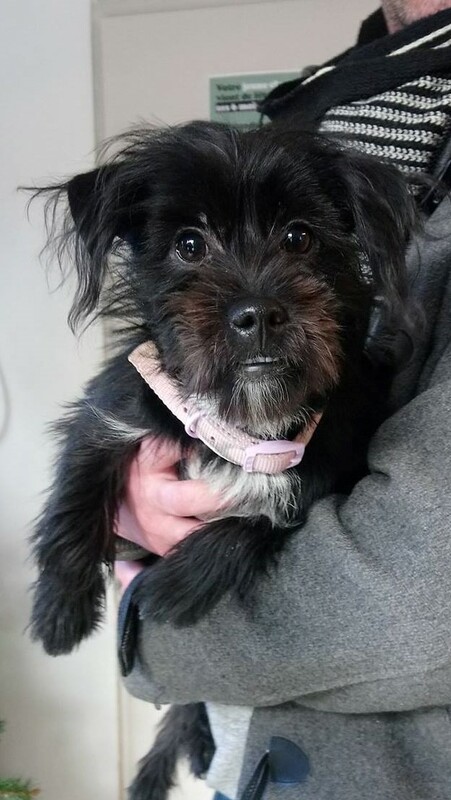 Google was brought in for rehoming at the end of November, due to family illness. However as he was brought in in a responsible manner, we knew a lot about him. We knew, for instance, that he is good with other dogs and children, and that, although he has lived with cats, he would rather not. 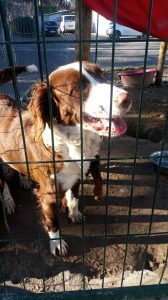 He has hated his time at the refuge, as up till now he has known nothing other than a loving family home. Today Google, now renamed Sky, has left for a wonderful life. He will be accompanying his new master everywhere. He will be riding on the tractor and looking after vineyards…when he is not lolling around in front of a fire, that is. 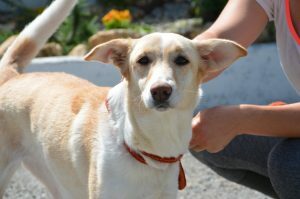 The week has not been exactly full of adoptions so far, but even a steady trickle of leavers helps to keep spirits up. We have had a couple of reservations too, so more good news to come later in the week. We love having adoptions on a Monday, as it lifts everyone’s spirits enormously. 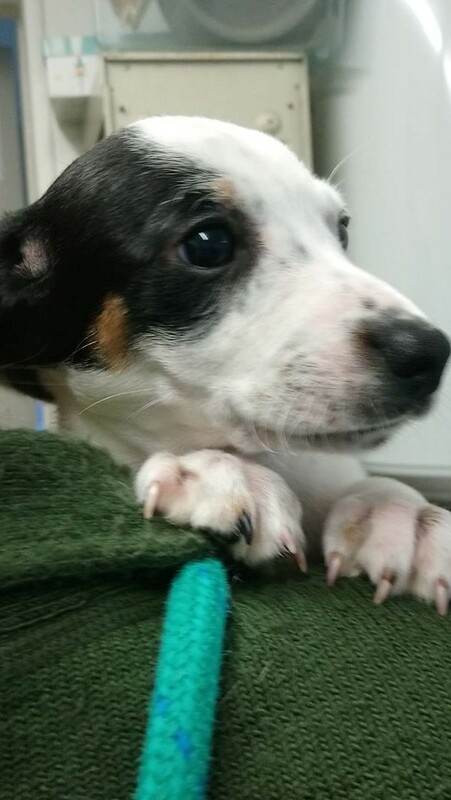 After a surprisingly long ten weeks at the refuge, Puppy Merry left for his new home today. Eagle-eyed readers might remember puppy Pippin, who was adopted ten whole days ago. Well he and Merry are brothers. Both dogs arrived with a skin complaint, resulting in several weeks’ worth of isolation. Once the pups were visible, Pippin was adopted immediately, but it took a bit longer for Merry to find his new family. This was quite a surprise, as experience has showed us that black dogs take longer to be adopted. The black and tans are usually very popular. Merry has not been alone since saying goodbye to his brother, and has been sharing one of the small outside parks with a variety of dogs. Now however he will have to get used to something new, as his new pals will be humans, including small ones, plus some rabbits and a parrot! We are sure that Merry will adjust to his new life perfectly and make his new family very happy. Let’s hope today’s adoption bodes well for the rest of the week. 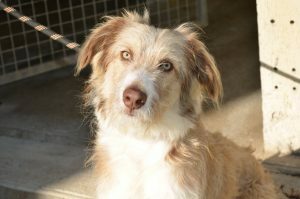 This week has been a pretty grim one at the refuge, with a LOT of new arrivals, and until today, only two adoptions. 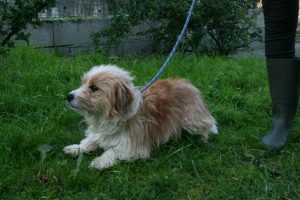 A couple of dogs have been reclaimed, of course, but with so few dogs finding new homes we are all getting quite worried. We have no reason why it should be the case; we all agree that we have the best dogs in the world, but for some reason adoptions have been excruciatingly slow of late. Today things are looking a tiny bit better with the adoption of Moliere. This lovely border collie cross arrived at the refuge in early December when he was just five months old. That was 6 weeks ago, and we were starting to wonder, as we do with so many of our not-quite pups, if this lad would be left behind. Yes, it is a difficult age, especially when even younger dogs keep arriving. Not everyone is not after a pup, though, and in fact Moliere’s new family were looking for a young dog, one who would not grow to be too big but one that would make a good companion for a young, active family. They visited the refuge yesterday and had a think overnight, then contacted us this morning to say that Moliere had stolen their hearts. So this afternoon a very happy dog left with a very happy family! Exciting times indeed and we look forward to news and photos in due course. We are hoping that next week will be a bit better in terms of adoptions, so please keep your fingers crossed for all our lovely dogs. Well, following yesterday’s adoption of puppy Diamant, today we said farewell to puppy Gimli! As some of you know, the ScPA has been on a bit of a Lord of the Rings naming session of late as far puppies are concerned. So when this little lad arrived looking for all the world like a rottweiler crossed with a dachshund, calling him Gimli seemed the only possible course of action! Yes, we do get some improbable mixes, and although we can never be sure of a dog’s parentage (or how the mix came about!) one thing is sure, Gimli is a fabulous looking chap who has left the refuge after the shortest possible time. Dogs can leave before ten days are up, but only if we are certain their owners are not looking for them; ie when we have a contract officially surrendering the dog for rehoming. Otherwise dogs have to spend ten days behind bars (and without walks), to give their owners a chance to find them. This is not nice for the dog, of course and for that as well as a number of other reasons, it is far better to bring a dog in after having contacted the refuge beforehand. As we have said on many occasions, the more we know about a dog, the easier to find the right him or her the right home. An adoption is how we like to start every week, and let’s hope for plenty more good news to come!